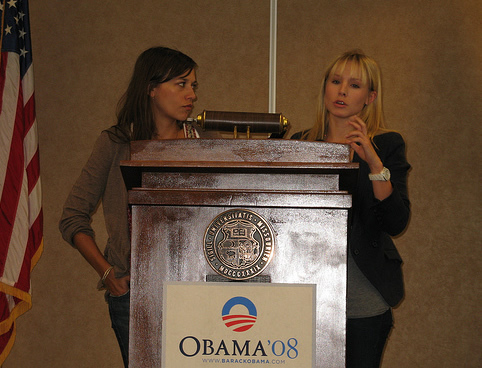 Two of my biggest TV girl crushes, Kristen Bell and Rashida Jones (oh how far I’ve come) were together on Friday at MSU for an Obama rally. Although I’ve met both Kristen and Rashida I’ve never been in the same room with both of them at the same time. I think it would be vaguely awkward as I’d probably pepper them with questions about how they got to be awesome so and of course how they maintain such perfect skin. Kristen: So Shida, to really reach the kids, I think we should start with an “Itsy-Bitsy-Spider” shadow play. Rashida (thinking): Why don’t you investigate what I think about that idea Veronica. Kristen: Ok, again, we are very sorry that your shows weren’t on on Thursday night because of the VP debate. Just vote Obama so things can get back to normal, ok? Karen and Veronica totally would. Kristen: If you vote Obama, I will petition Heroes’ writers to write a hot love story between Elle and Hiro… or Claire, whichever you prefer. Rashida: She may never tell, but I swear if I don’t get to speak, i’m gonna yell that she is Gossip Girl! how in the world did i miss this? i watch the news everyday and i live 25 minutes away from the campus. how did this happen?